In my uTest review today, I will be checking out what this opportunity has to offer and how it can help you make money! uTest is an interesting site that will pay you for a whole variety of activities, but these will usually involve visiting a website or App, following certain instructions and reporting your findings. Website owners, developers and app developers need people like you and me to check whether websites and apps are running as they should. While following direct instructions, you can report on things such as the functionality of a website, whether it has any bugs or errors, whether there are grammatical or technical errors and so forth. However, not all tests involve specifically testing websites. For example; I saw one relating to store loyalty cards and another test relating to testing your internet connection speed. Each test has different requirements and you can be paid differently depending on the work involved. You can also work towards increasing your pay potential, as you gain experience and climb the ranks. Having looked at many Usability testing sites in the past, this website is unique to those in many ways and I believe could have more earning potential in the long run. Today, I will be covering the following topics…. How To Get Started With uTest. uTest Ratings – How You Can Earn More! Does uTest Have A Referral Progam? Alternative Ways To Make Money Online? uTest is a Usability testing website -primarily where website owners, businesses and App developers can get feedback on their websites, applications and projects. Some Test Cycles have very specific requirements, which mean they cannot be automatically emailed and you. Therefore, you will have to browse these in the project section of the uTest website and apply independently. Within each Test cycle, there will be particular instructions you need to follow step-by-step. At first, this could be as simple as visiting a website, navigating the main page and giving some feedback about it. I recently applied to join a test, which involves a study visiting an amusement park website, (see image below). For this test, you don’t need any specific experience – you just need to be a native French or English speaker. How To Get Started With uTest? In order to get started, you first need to set up an account. You will then need to give basic details – including your full name, address, DOB. You then need to select what type of device you will use, including the current make of your phone. I was really pleased to see I could still join using a Chromebook, as other usability testing sites, (such as User Testing) don’t allow this. Once you’ve completed these steps, you will be taken to a page explaining what steps to take next. The first is to begin uTest academy and if you click the link to do so, you’ll be taken to a page with a video on it and this just gives you an additional overview about uTest. You then need to complete an application in order to receive uTest academy invitation. You need to select which Academy to sign up to. I chose computers for now. You’re then asked to login and find your ID number, (you are shown where to find this). There are then some other conditions you need to check via your account and simple instructions how to do so. Finally, you’re asked to watch two more videos for training purposes. 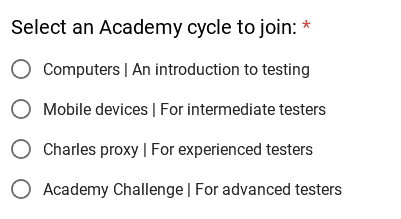 To have the best chance of getting invited to tests, I strongly recommend you spend some time filling out your profile in full – so that it’s complete. uTest is a good option for people looking to make some extra money from home. Ideally, this sort of opportunity would suit students, stay-at-home parents, or just anyone who has a little extra free time to do it! It would also suit people who have a genuine interest in this sort of work and enjoy providing people with feedback. There are opportunities to increase your experience, your expertise and your pay potential here. As small-time income opportunities go, website testing is by far one of the most enjoyable and interesting. It’s also quite rewarding because, your feedback can really help the website owners and help shape their site for the better. So, your participation, could have an impact on a completed product or service. How Much Do you Get Paid For Tests? With most sites similar to this, the Pay is clearly defined. The tests are normally for a set amount of time and you may get paid around $10 per test. However, things look quite different here. The test seem more varied and how much you can be paid will also vary on the Test Cycle! Pay will depend on the nature of the work, but also your own skill level. The more experience you get, the higher your overall uTest score and you will be able to get better paid work. It would seem a small number of people do turn this sort of work into a full-time career. For the most part though, a majority will use it to boost their income. You can also make significantly more money if you recommend some of the Test Cycles to others. You can get paid either via PayPal, or Payoneer right now. You need to have made at least $10 before you’re eligible to withdraw. Also, you won’t have the option to link your Payoneer account, unless you have already made at least $10. No matter your location, you will be paid in US dollars. PayPal has a simple way to exchange your money into your local currency though. The more tests you do, the more ratings you receive and over time, you can move up in the ranks. These include: Rated, Proven, Bronze, Silver and Gold! To avoid getting a low score, always complete in a Test Cycle when you accept it and be careful when submitting bug reports. Because, having your bugs rejected will inevitably lead to a bad score over time. To boost your score, increase your overall activity on the uTest platform – by participating in Test Cycles. Naturally, your overall goal would be to one day become a Gold rated tester – these testers will have access to all the highest paying jobs! Does uTest Have A Referral Program? While uTest doesn’t independently have a referral program, some of the individual “Test Cycles,” or tests have their own referral rewards. So, for example, I found one particular Test Cycle that paid a 50 Euro bonus per successful referral you introduce to the study. How much of a bonus you get will vary from test to test (and some may not have any). Certainly, if you know of people that could be interested in this type of work, this could be a way for you to make up some significant extra money. A great way to earn a bit of extra money in your spare time, (and possibly more as well if you’re open to learning and progressing!). Can be well paid for the time invested. More interesting than some other Usablity testing sites and with more scope to earn more, (depending on your skills!). Large training section, where you can complete courses and increase your knowledge. You can interact with other members on the platform. May be a little confusing starting out, if you have zero experience. May be hard getting accepted to your initial tests, as an unrated member. uTest is legit and I really like the incentive they have to do better and potentially achieve much more in the long-run. If you find you particularly enjoy this type of work, there are some people making good money doing it. If you become exceptional at it, there is some potential there to make this more than just pocket money. I’m going to be spending some time with uTest myself and seeing how I do, so I can document that here, once I do. It definitely seemed unique from some of the many other Usability sites. You may also be interested in these testing sites….. In my opinion, websites like this are one of the best ways to make quick money in your spare time. You can dig in when you like and step back when you want a break, with zero commitment. One of the biggest problems is getting enough work – one day there may be several tests you can do and other day, zero that you qualify for. Another issue is, that this is still exchanging your time for money and so, it isn’t an opportunity to make passive income. Passive income is the sort I’m most interested in long-term, as it means that the work I put in today – continues to pay me in the future. The main way I make passive income, is through running this website. I make money writing about things that interest me and getting paid via paid advertising on my site and affiliate marketing. You may also find this post useful – which outlines 40+ ways you can make money online. That rounds up my uTest review for now…. Do you have experience with sites like this? Let me know in the comments!